Throughout the project’s implementation, the children and youth from the target group complete tasks specifically designed for them. These tasks were inspired the approach of Self-Organized-Learning Environments (SOLE), meaning that the kids and youth themselves have to discover, research and understand the answers. We gave them the tools to do that, but developed the approach so that it would fit the project’s target group. These tasks are divided into six themes: six educational boxes, which are based on the results of an initial needs assessment conducted by the research partners with the stakeholders and parent of the children. 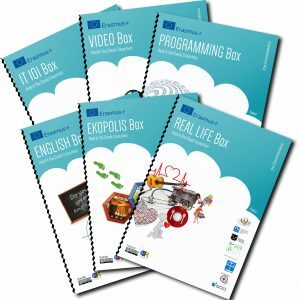 Each of the box is implemented for a time period of 2 months in each of the three implementing partners locations in Kosovo, Romania and Slovakia. For further information on the contents of the individual boxes please see the more detailed descriptions.